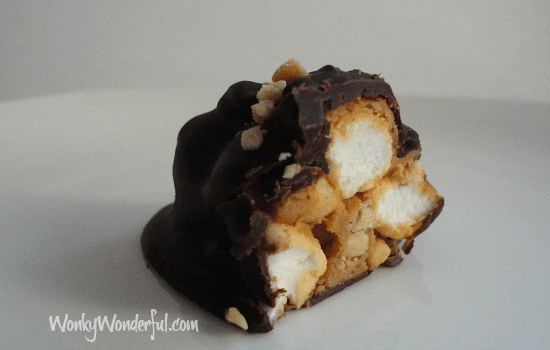 Yep, A FlufferNutter Truffle!Thick, Sweet Peanut Butter … Soft, Squishy Marshmallows … Crunchy, Salty Peanuts All Sealed Together in a Rich Chocolaty Shell. A Challenge. I am not a big peanut butter fan. I don’t hate the stuff, but I also don’t go out of my way to eat it. Okay, the challenge made this experience more fun. After several failed peanut butter recipes, I finally got it right. 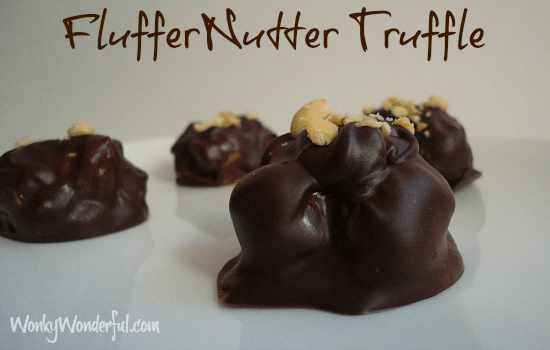 You know these truffles are good if a non-peanut butter lover like me can’t stop eating them. Julie at White Lights on Wednesday.This recipe is super quick and simple, no baking involved. Just Mix, Melt, Dip and Eat! 1/4 cup Powdered SugarRoll mixture into walnut sized balls and place in the fridge or freezer to chill while you melt the chocolate for dipping. 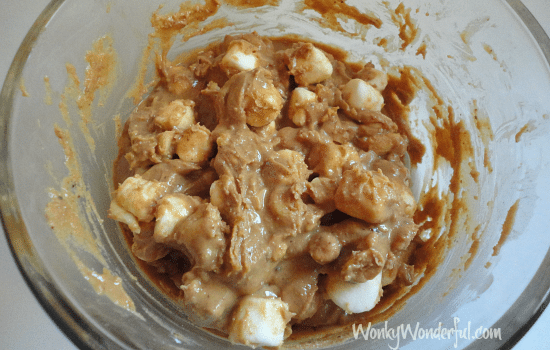 1/2 tsp Coconut OilMelt the chocolate and the oil on the medium-low stove top setting, stirring constantly. This should only take a couple minutes. 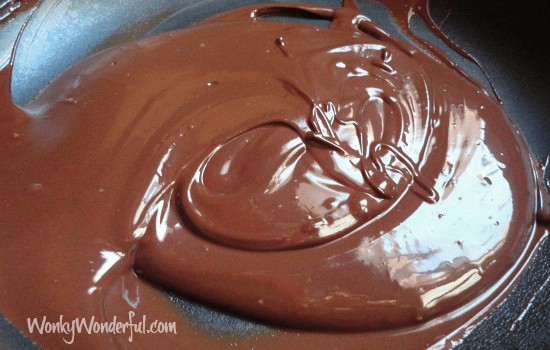 Remove from heat once the chocolate is shiny and smooth like below. Dip:Take each fluffernutter ball and dip it into the melted chocolate. Place onto a tray or cookie sheet lined with wax paper. 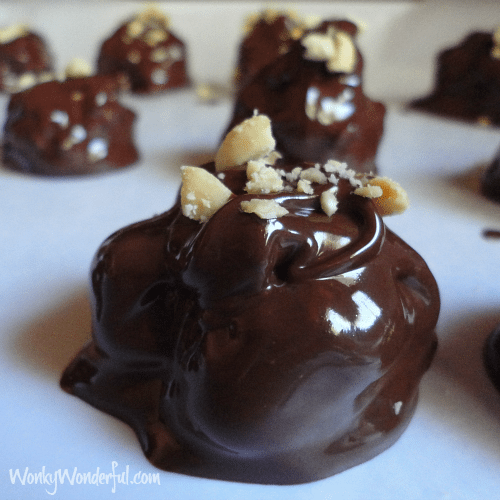 Once all the truffles are dipped, sprinkle crushed peanuts on top to make them look Purdy. 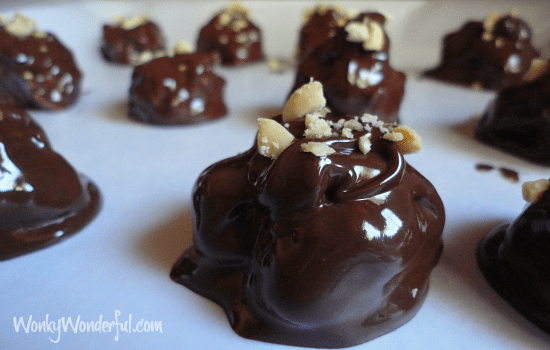 Place truffles back into the refrigerator until the chocolate cools and becomes a shell.This recipe makes approximately 14 truffles. That’s It! Now you have Sweet and Salty Truffle Perfection. Plus, you get to repeat my favorite word over and over … FlufferNutter … FlufferNutter … FlufferNutter!!! I hope you enjoy these as much as I do. 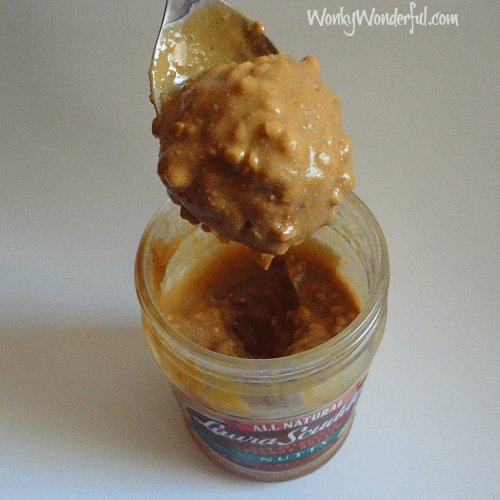 Peanut Butter fan or not, give them a try. This is really delicious. I liked it a lot. Thank you for sharing this wonderful post. Thanks Diana! I’m so glad you enjoyed!